It might be a little bit country. Some call it Western or Appalachian. We're bringing a taste of it all to the Big City this fall with three old time square dances in the park, brought to you by Southwest Airlines! Come on down for a promenading, do-si-do-ing good time. We're putting together a night of fun, including live banjo and fiddle music, delicious down-home fixings from 'wichcraft at The Southwest Porch, and an expert caller to keep you dancing all night long. Country festive attire is encouraged. No experience required. You're in good hands. Follow along as Dave Harvey of NYC Barn Dance calls out the steps, and directs your moves. All dances will be taught all night long, as you swing your partner to the sounds of The Remedies. No partner, no problem. Square dancing calls for friendly groupings throughout the dances. We'll pair you up to create squares, as necessary. So just kick back and focus on the toe tapping. Whether you came with friends or not, you might just make a few new ones. Come one, come all. We've got a few surprises in store, like western themed giveaways, and chances to win tickets on Southwest Airlines, so you won't want to miss this one. 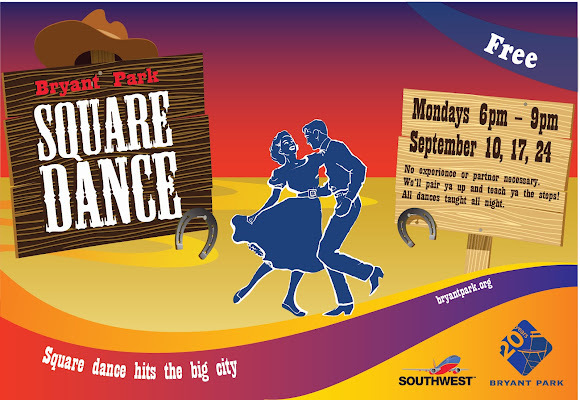 Make the Bryant Park Square Dance a new fall tradition in the park. I'm coming back next Monday, with more friends!